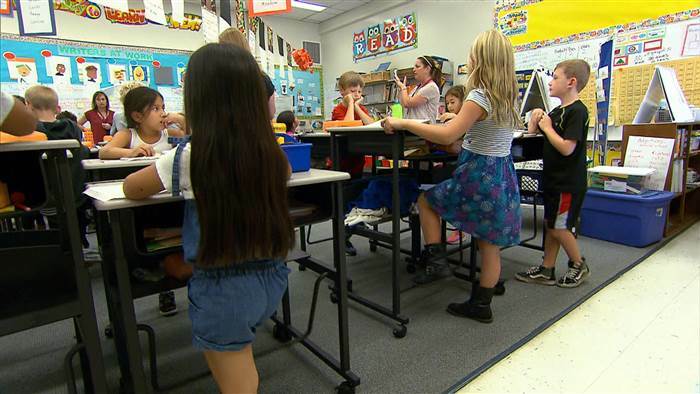 The advent and rise of standing desks in offices and schools around the country has been attributed to a desire for a healthier lifestyle in workplace and academia. ‘Sitting is the new smoking’ has become the adage de jour, though the conclusions reached by health experts are nothing to dismiss: Sitting for extended periods of time can serious affect cardiovascular and metabolic health. So how can standing desks help? Aside from the obvious not-sitting improvement, standing desks offer a number of benefits that employers, employees, and students are looking to take advantage of. But it’s important to determine exactly what having a standing workstation means, and, just as important what it doesn’t. Let’s be clear: Doing too much of anything can have negative impacts on your health, even if it’s something that gets us through the day (and we love dearly). But a consistent question about standing desks revolves around the potential strain on various body parts and functions that are just as bad as sitting. Just as with sitting, there are right ways and wrong ways to stand. If you adopt a standing desk and spend the duration of your time on one leg or with your work station at varying heights, you’re not likely to experience the benefits associated with staying on your feet. It’s important to tailor standing desks to the specific attributes of its user – they are most definitely not a one-size-fits-all experience. But equally important to remember is that standing desks are not created to make their users stand all day; rather, they are created as a substitute for sitting all day, which continues to demonstrate its health consequences. For those unable to get out of their chairs all day, it’s important to take advantage of resources that can help reduce the strain. For those of us used to sitting most of our waking lives, be it learning, working, or writing a blog post about standing desks, adopting a standing lifestyle comes with growing pains. While the health community seems to be in general agreement about the negative effects excessive sitting and an overly sedentary lifestyle, that doesn’t necessitate quitting cold turkey. Remember that this is about getting healthier, not contorting yourself into a stress position. If you aren’t used to spending time on your feet, it’s a process to be eased into. If you experience lower back or knee pain, don’t remain upright just because you fear the Grim Reaper that is your chair. Adopting a standing workspace or living area requires practice, patience, and hours logged. Remember that reducing your overall sitting by just over an hour a day has demonstrable health and mood benefits. It’s exciting to incorporate healthy decisions into your life, but remember to take it a day at a time. Sorry, you might not have to make that IKEA run you’ve been looking forward to after all (although…). With standing desk use becoming ubiquitous with health benefits and increased productivity of their users, many employers and employees are looking to incorporate them into their work stations. The brands and styles of standing desks can vary wildly, from Star Trek to the paleolithic. Whether you decide to take the Bentley or the DIY approach, it’s important to remember that you have choices. As said above, the key is to make sure you are not just standing but standing correctly. The desk that costs as much as your mortgage but doesn’t give your wrists or eye alignment the proper placement will be doing much more harm than good, whereas Doug from Accounting’s milk crate fortress may give him the best posture. The first thing to check is how your workspace will adapt a to a standing environment, both physically and aesthetically. For the latter, you’ll want to speak with a higher-up to make sure it’s okay to make the switch – surprising the CEO and their new clients on an office tour with your unsanctioned standing desk is not a situation where forgiveness trumps permission. For physical space, there are resources that can help you make the best decision based on your body type. Now, you’ve got the greenlight and your tape measure – which standing desk is right for you? The good news is there are plenty of options available, and the better news is there are a good deal of them you can make without too much trouble. If your office requires a semblance of uniformity, they may already have one in mind for your needs. Otherwise, feel free to take a MacGuyver approach and make your workspace your own. Remember that it should be customized for you, and there’s no shortage of ways to Frankenstein your way to the perfect standing desk without getting hit in the wallet. If you aren’t sure where to start, The Wire Cutter put together this opus on some of their favorites. Sadly, we’ve come so far and it still might not be enough. The damage sitting does over an extended period of time is enough to negate the benefits of exercise. Standing desks, while a great alternative, are just one of many different things we can be doing to maintain our health and functionality. Even incorporating smaller changes can help set in motion a tectonic shift in our lifestyle and overall approach to well-being. Using a standing desk at work then going home to the couch and potato chips isn’t going to provide the health benefits you’re looking for. Standing may be a first step, but there’s a host of other ways to get and stay active. Depending on your surroundings, there’s even exercises you can do at your desk (no treadmill required). The point is that a standing desk is a great step in the right direction, but it is just that – a step. The benefits are real, but users need to be accountable to themselves with how they are treating their bodies (and minds) away from the office as well. Hopefully a standing workspace is just one of many ways you’re adopting a more active lifestyle into your daily routine. Your body will thank you for it. This entry was posted in Blog Articles. Bookmark the permalink.